If we consider the statistics of this left flank chain in 2003/04 season, we realised how important they were in the team. Firstly, they scored 60% of team goals. It was mainly because Henry and Pires were the top two goal scorers in the team. Secondly, they made 49% of team assists. In short, in every two goals, one of them was from the left flank assisted by one of these three players. In short, it showed that Arsenal 2003/04 relied heavily on the left flank to attack. The left flank attacking combination was formed by Cole (left back), Pires (left midfielder) and Henry (left striker). 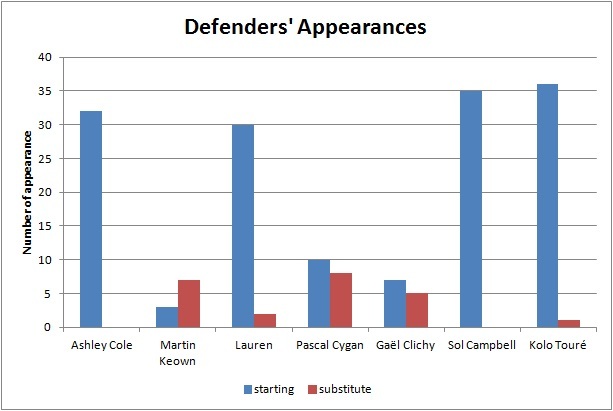 Ashley Cole was an attacking-minded left back. He was good at crossing also. Firstly, 75% of his assists were made in the final 18-yard area. The following video shows the assists made by Cole. This shows that he had the ability to make attacking runs to the final third frequently rather than staying in the midfield. Secondly, 50% of his assists were crossing. This shows that he was able to contribute for the team by delivering the ball into the box himself. Pires was a left midfielder who drifted into central position by using his right foot. In season 2003/04, all his open play goals were scored in the central area. However, he was not the midfielder who scores goal by long shot in central area. His strength was to make attacking runs into the penalty area to score goals. 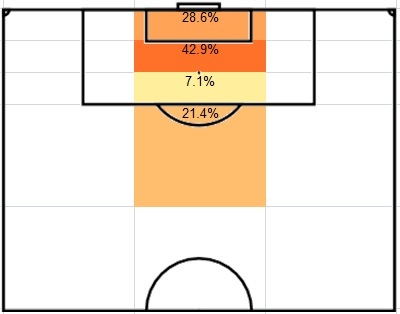 78.6% of his goals were scored in the central penalty area, 21.4% of goals were scored in zone 14. The following video shows the goals scored by Pires in 2003/04. 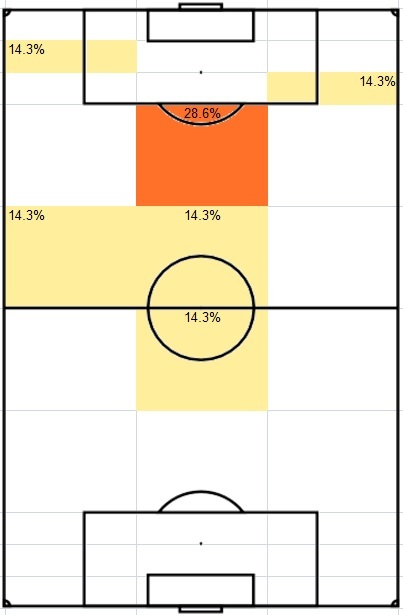 On the other hand, he had made most of the assists in central area (57.1%). Zone 14 was Pires’s active zone because 28.6% of his assists were made in this zone. The following video shows the open play goals assists made by Pires. All the evidences above showed that Pires was a left midfielder who attacked mostly in the central area. Henry was strong at attacking space behind the defence. This could be analysed by looking at the assists styles of Henry’s goals. He was good at exploiting space behind the defence because the largest proportion of his goals (30%) was come from through ball. It fitted his style as he was a fast runner. For further details about Henry, please refer to the invincibles analysis part 3. All these three players were top players in 2003/04. More importantly, their playing styles fitted each other so that their combination made a great contribution for the team. Firstly, Pires was strong at passing through to the space behind defence. 43% of his open play assists were through ball. It fitted Henry’s strength because he was strong at attacking space behind the defensive line by his pace to score goals. The following video shows some examples of the combination of Henry’s run and Pires’s through ball. Secondly, from the positional perspective, Pires tended to drift into central position and it gave more space for Cole to attack and make overlaps. The following video is an example of how it worked. Thirdly, Henry was a striker who tended to stay at left flank. He had made most assists by crossing in the left flank. His style fitted Pires’s attacking runs into the central penalty area. The following video shows how they fitted each other in terms of their positions. “The Invincibles” Arsenal 2003-04 Analysis (2) – Were Arsenal a one-man team? No doubt, Henry was the most important player in “the invincible” squad. However, were Arsenal a one-man team in 2003/04 season? This question would be analysed in this post. As the top goal scorer in the team, Henry scored 41% (30) of the team goals (73) in that season. 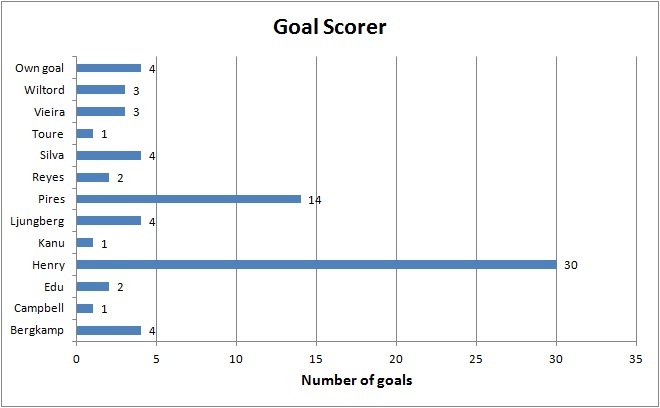 As shown in the above chart, Henry absolutely outperformed other players in terms of goals. Apart from Henry and Pires, nobody else scored more than 4 goals. Probably the best striker in the world at that time, Henry was able to do something different comparing with other strikers. For example, a target man needs crosses provided by teammates. A poacher needs through ball or penetrative pass. However, when somebody gave Henry the ball, he had the ability to do the rest by himself. For example, the following video shows how good his dribbling was. In this goal, the assist was made by Henry as well because I will code it as “self-assist” if the goal scorer scored the goal by beating opponents by dribbling. My definition of “one-man team” is that the team is heavily (or just) relying on the performance of certain player. Was that the case in the “invincible” squad? The above evidences and examples may suggest a “yes” but I argue Arsenal were NOT a one-man team because of three reasons. There were seven penalty goals which were all scored by Henry, so it would be fair to take them out and look at the goal distribution again. Henry’s 23 goals took 35% of the team goals. 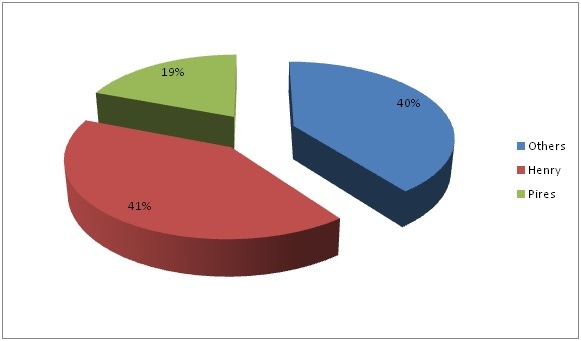 As shown in the chart, there was a second reliable goal scorer in the team as well. Pires scored 14 goals which were 21% of the team goals. Apart from analysing the number of goals, the efficiency should be considered as well. The top 5 goal scorers in the team were taken out. Their number of goals were normalised by considering their number of starting appearance as well. Henry was still the most efficient striker, scoring 0.61 goals per appearance. The goal scoring efficiency of Henry and Pires were much better than the rest of the team. 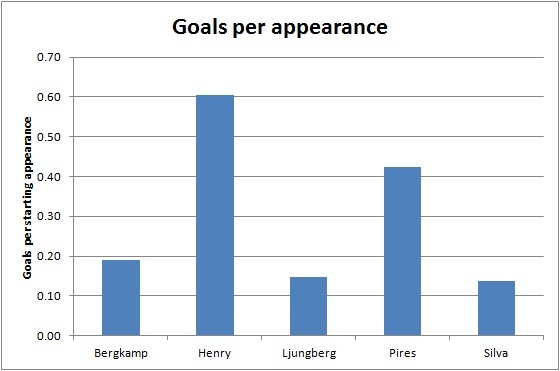 The above two charts show that in terms of goal scoring, Arsenal were not only relying on Henry due to the presence of Pires who was a efficient and reliable goal scorer as well. When the position of the goal scorer was considered (own goals were taken out), it further supports my argument. The forward players scored the most (33 goals) which was 53% of the team goals. 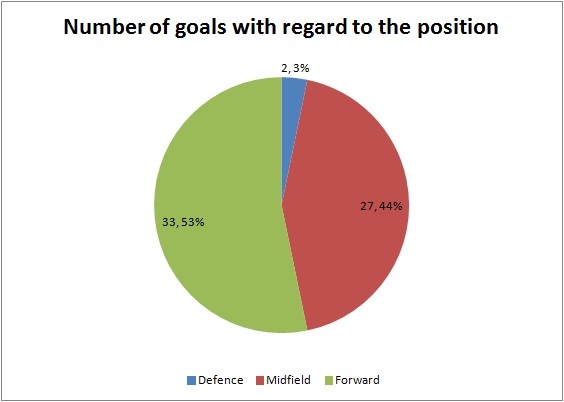 However, it also shows that the midfield of Arsenal was a strong goal scoring force by scoring 44% of the team goals. I agreed that the forward players heavily relied on Henry who scored 23 out of 33 (70%) forward players’ goals. However, it was not the case for the whole team. Apart from being the top goal scorer of the team, Henry was also the top assist maker as well, making 18 assists in that season. Only 3 of them were self-assist by dribbling past opponents before he scored. 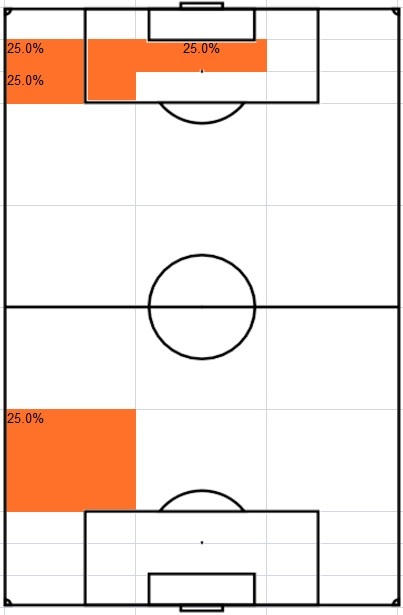 However, Henry’s effect was not as obvious as shown in the goal chart because he took only 26% of the team assists. 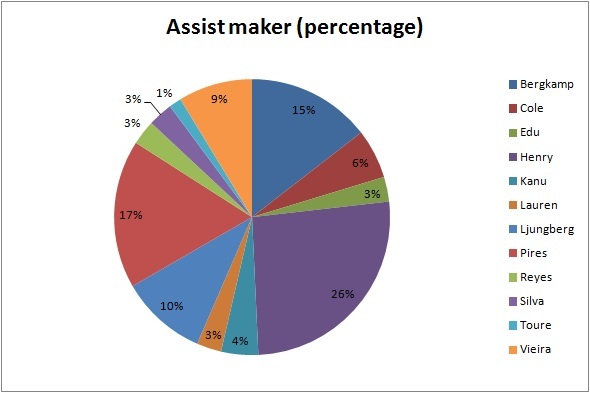 The chart shows that the responsibility of making assist was well shared by several players. The most obvious top 3 assist makers were Henry (26% – 18 assists), Pires (17% – 12 assists) and Bergkamp (15% – 10 assists). 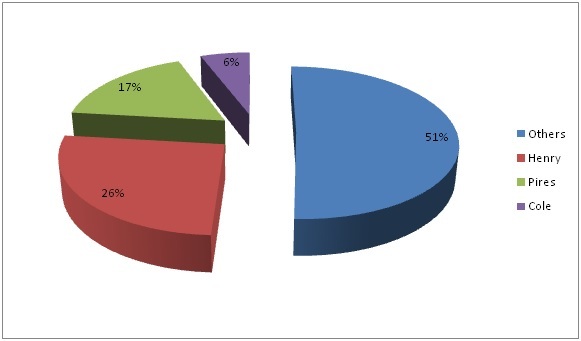 This chart could be analysed in two perspectives. Firstly, Arsenal had a good strikers’ partnership of making assist. Although Bergkamp hadn’t scored many goals (4), his contribution in making assist was obvious. The Henry-Bergkamp partnership took 41% of the team assists. Secondly, the 6th assist maker was Cole who was a left back. Considering the left side combination (left back, left midfielder, left forward), the Cole-Pires-Henry combination took 49% of the team assists. That means for every two goals Arsenal scored, one of them was assisted by one of the left trio. It shows how strong the left side of Arsenal was (I will write a post for this topic in future). The above two evidences show that even Henry was a world-class player, there were some top players playing with Henry at that time. By considering the position chart, it shows that the effect of forward players in making assist was not as strong as goal scoring, decreasing from 53% to 48%. The contribution of defenders increased a lot from 3% in goal scoring to 10% in assist making, while midfielders had a more or less same percentage (44% and 42%). Looking at the assist can only give a clue about the final pass; it doesn’t show you the build-up of the goal. In order to analyse the players’ contribution in the build-up of the goals, the players involved in the goals have to be considered. 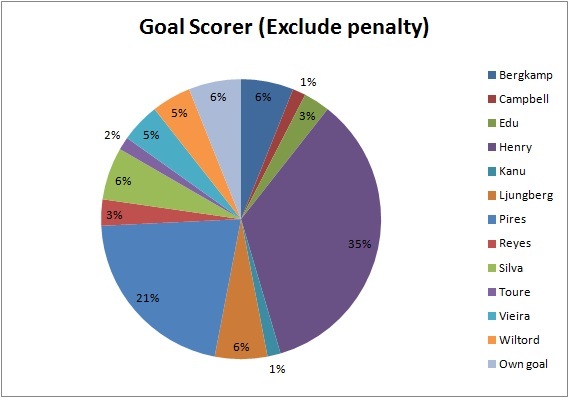 Note that the set play goals were excluded in the following charts. Only the top 6 players were shown in this chart. In 52 open play goals, Henry was involved in 35 of them (67.3%). There is a little gap between the top 2 players (Henry – 35, Pires – 30) and the other players. It shows that Henry and Pires were still the two key players in Arsenal’s build-up of goals. Similar to the assist chart, Bergkamp got the 3rd position. However, in the starting line-up of Arsenal, Bergkamp had the least starting appearance (21) comparing with Henry (38) and Pires (33). It shows another picture when the appearance was considered to normalise the data. In fact, the overall trends of two charts are very similar but Bergkamp’s performance and efficiency was the best when the data were normalised with number of appearance. For every single starting appearance, Bergkamp was involved in building up at least 1 goal. On the other hand, the difference between Henry and Pires became much less (only 0.01) which imply that their efficiency were pretty much the same. With the age of 34 in that season, Bergkamp didn’t play as much as before and wasn’t the focal point of attacking. However, with his high level of technique and vision, he still played a key role in building up the goal even he was not the person to make the assist every time. The following video is an example to show Bergkamp’s vision and technique to pass a “killer ball” penetrating two lines of defence. To conclude, there is no doubt that Henry was a key player in the “invincible” squad. However, Arsenal were not a one-man team because other players played key roles in different aspects. Pires provided efficient and reliable source of goals. Cole had a great contribution of making assist. Moreover, Cole played a key role in assisting Pires and Henry in the left side because the combination of these three players took half of the team assists. Although Bergkamp didn’t contribute much in scoring goals, his contribution was mainly focused on assist and build-up of goals. He was the most efficient player in building up goals. Arsenal 2003/04 unbeaten title-winning team have been voted as the Best Team in the Premier League’s 20 seasons awards. It is the first team to win the Premier League title having not lost a game. The last team to achieve it was over a hundred years ago. It was a big achievement that earned the nickname “The Invincibles”. Therefore, it is worthy to analyse this team to see what we can learn. How did they play? What were the characteristics of the players? It may not have the best players in every position but the chemistry they formed was the best at that time. I am trying to find it out through analysing the 38 league games. Goalkeeper Jens Lehmann played every league game in the whole season. Even Toure moved from a centre back to a right back, he was more than a defensive right back. His speed and strength made him playing well as an attacking right back also. The following video is an example. In short, the versatility of Toure gave the consistency in Arsenal’s defence, letting Wenger used 6 players mainly throughout the season. 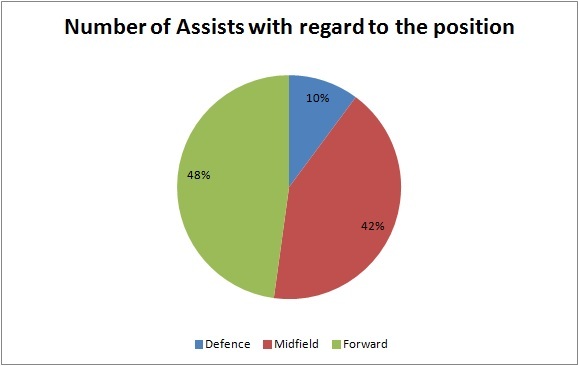 The chart of midfielders is not as obvious as that of defenders. It shows that more rotation was happened in midfielders. 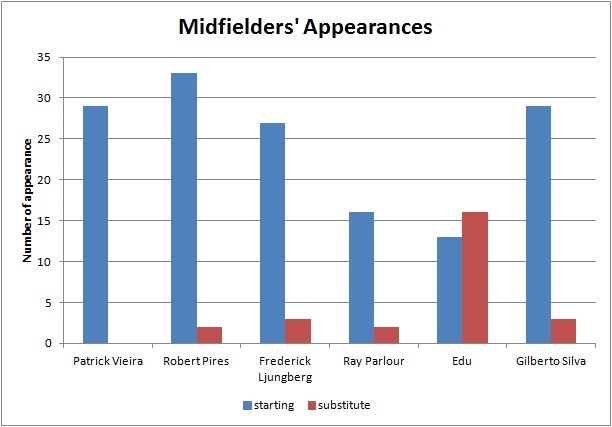 However, it still shows that Vieira, Pires, Ljungberg and Silva were the first team midfielders. Edu shouldn’t be ignored because he was Wenger’s first choice substitute in midfield, having 16 substitute appearances. In fact, if total appearances were considered, Edu had 29 (13+16) which is the same as Vieira. Only 6 midfielders were mainly used in the whole season showed the versatility of these players, especially the two backup players Parlour and Edu who played as both central and wide midfielders. Moreover, Pires and Ljungberg were able to play at both flanks. The combination of these 6 players gave the flexibility and consistency of a solid Arsenal midfield. It happened 4 times during the season. However, Wenger used a different approach in the late second half of the season, keeping Pires as left winger and put Wiltord or Reyes as the right winger. If both Pires and Ljungberg were not available, Edu could play as a left winger also. 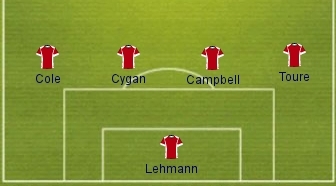 The rotation in central midfield was simple. Parlour and Edu were the backup of Vieira and Silva. However, the interesting point is that even Edu was the first choice substitute in Wenger’s mind; Parlour was the primary backup central midfielder when either Vieira or Silva was unavailable. There were 18 games when one of them was unavailable, Parlour started 11 of them and Edu started only 7 of them. The appearances and rotation in midfield could be linked to the analysis of formation. In 4-4-2, the central midfielder substitutes were still able to cover the wide position as wide midfielder or winger (e.g. Parlour in right flank, Edu in left flank). It is because the two strikers playing upfront are the main goal scoring power. The substitutes could act as a supporting role in wide position even though they are not good at attacking. Comparing with the 4-3-3, 4-5-1 or 4-2-3-1 nowadays, it is rarely to see a central midfielder to take over the winger position because the winger position in these formations requires more attacking attributes due to the lone striker system. Henry was definitely a first team member starting all 38 league games. Therefore, what Wenger had to decide is using whom as Henry’s partner. Wiltord got more chances firstly. In the first 10 games, he started 5 times and played 3 times as substitute. However, he was not in Wenger’s first team plan since then. Bergkamp, having 21 starting appearance, was the partner of Henry in most of the season. However, may be because of Bergkamp’s age, he didn’t play many games continuously. Wenger used Kanu, Aliadiere and Wiltord as the backup. The situation changed after January’s transfer window. Reyes joined the team and got the chances immediately. The total number of games Reyes played in half season (13) was more than Wiltord (11), Kanu (10) and Aliadiere (9) playing in the whole season. Note that in some exceptional cases, Wenger used Reyes and Wiltord as left and right wingers. Part 2 – Were Arsenal a one-man team?